Home Should Be A Safe Place For Companion Birds, But How Bird-Friendly Is Yours? The introduction of a bird into the home demands careful attention be paid to the environment outside of the bird cage. Parrots that are permitted to leave their cages can easily be harmed from the many different hazards that are a part of everyday human living. Bird-proofing a home is even more intensive than child-proofing it, since parrots can fly and can fit into tiny crevices. As owners prepare their homes with bird safety in mind, they need to visualize each room from a "birds-eye-view" to identify potential dangers. A bird's natural curiosity can cause disaster with any of these hazards. It is best to keep birds in their cages when someone is cooking in the kitchen. However, even if no cooking is taking place, owners should be careful to guard against other hazards exposed through seemingly harmless daily activities. This may include never filling dishes with water to stand soaking in the sink. But these risks shouldn't necessarily restrict a bird to its bird cage. Parrots can enjoy time in the bathroom with their owners, assuming specific safety measures are put in place. For example, owners can place decals over bathroom mirrors so that their birds will not become confused or frightened. Toilet seats should be left down and all medications and hygiene products stored securely in cabinets not accessible to birds. Finally, owner vigilance is essential if birds are allowed in the bathroom with full tubs or sinks. Birds will also have difficulty navigating homes with lots of windows or glass doors. Just like wild birds, a pet bird does not understand how glass works and will attempt to fly right through it if it is outside of the bird cage. Parrot owners will need to guard against this hazard since all homes have windows. A simple solution is to make sure that windows are covered by drapes or shades when a bird is flying outside of its bird cage. Parrots can still become entangled in drapes or cords, but owners can lessen the possibility of injury from this if they keep the bird’s toenails clipped to a reasonable length. Some owners clip their bird’s wings. This can help slow a bird's flight, which prevents escape and minimizes injuries from windows and glass doors. While it is best to hide all cords, owners may find it nearly impossible to eliminate every electrical hazard, especially since birds are small enough to fit into the tiny crevices they may be trying to use to hide the cords. Also, many people use chargers on a daily basis, and it may be difficult to constantly keep them out of the reach of their birds. Spiral cable wrap and cord concealers may be purchased to protect the most exposed hazards. PVC pipe or hard tubing can also be used for this purpose. An owner should always watch his/her bird when it is outside of the bird cage. Parrots will develop favorite activities or places to spend most of their "free time." If an owner realizes that a bird is too curious around electrical cords or begins chewing through the spiral cable wrap, additional measures will need to be taken to prevent electrocution, such as unplugging cords or limiting a bird's access to rooms with exposed cords. Parrots can benefit greatly from spending time outside of a bird cage. Parrot health depends on safe opportunities for regular exercise, exploration and socialization. 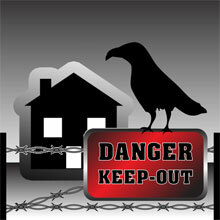 This article focused on some of the common safety risks for birds in most homes. Part Two of this article will discuss additional concerns including air quality control and preparing birds for socialization with children or other pets. Creating a safe space for birds to have a bit of freedom may seem like a daunting task, but it is nevertheless important for avian physical, psychological and emotional health.